Slenges from maritime users and further sites to be announced in 2018, productive waters of the UK the UK Government has begun the search for ef? cient and cost-effective meth- ods to assist in the long-term management and monitoring of the newly pro- continental shelf support a tected marine habitats. 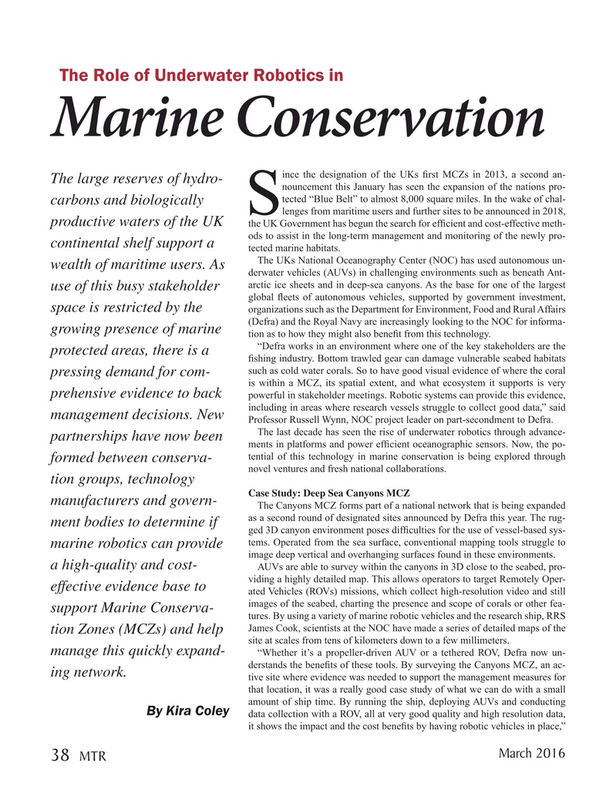 The UKs National Oceanography Center (NOC) has used autonomous un- wealth of maritime users. As derwater vehicles (AUVs) in challenging environments such as beneath Ant- arctic ice sheets and in deep-sea canyons. As the base for one of the largest use of this busy stakeholder global ? eets of autonomous vehicles, supported by government investment, space is restricted by the organizations such as the Department for Environment, Food and Rural Affairs (Defra) and the Royal Navy are increasingly looking to the NOC for informa- growing presence of marine tion as to how they might also bene? t from this technology. Professor Russell Wynn, NOC project leader on part-secondment to Defra. The last decade has seen the rise of underwater robotics through advance- partnerships have now been ments in platforms and power ef? cient oceanographic sensors. Now, the po- tential of this technology in marine conservation is being explored through formed between conserva- novel ventures and fresh national collaborations. James Cook, scientists at the NOC have made a series of detailed maps of the tion Zones (MCZs) and help site at scales from tens of kilometers down to a few millimeters. manage this quickly expand- “Whether it’s a propeller-driven AUV or a tethered ROV, Defra now un- derstands the bene? ts of these tools. By surveying the Canyons MCZ, an ac- ing network.